Search engine optimization (SEO) offers a quality investment opportunity for dental practices in need of a boost. Improved SEO leads to higher search ranking results that help you stand above the competition, enabling you to bring in more new patients to fill those empty slots in your schedule. However, staying up-to-date with the latest SEO trends and tactics can seem exhausting when you have a practice to run and patients to treat. Investing in SEO hoping to attract new patients can seem like a waste of money when your marketing strategy doesn’t yield the expected return on investment. But just as choosing a podiatrist to perform a root canal is a poor choice for patients, so too is trying to handle your online marketing if you don’t possess the knowledge needed to create an informed strategy. With Google constantly shifting the SEO landscape, you need a marketing partner that understands the best SEO practices for strengthening your brand online. As an online marketing firm for small businesses, Local Fresh has to the tools and experience needed to help improve any dental practice’s SEO marketing strategy. If you want to improve where your practice appears on the page in a Google search, then Local Fresh has your SEO solutions. To give you an idea of what Local Fresh can do for your practice, here are a few tips on how to maximize your SEO results. The one basic principle of SEO that most every business owner knows is that you should strive to rank highly for your primary keywords. For dental practices, those terms typically relate to a practice’s physical location. If you run a practice in New York City, you probably want to rank highly for keyword terms like “dentist in New York City”, “New York City dentist”, or “NYC dentist.” Of course, trying to rank highly for these keyword terms place you in direct competition with the hundreds, if not thousands of other dentists also marketing their practice online. New York City is also a big place. Queens, Manhattan, Brooklyn, SoHo, the Bronx – ranking highly for the term “dentist in New York City” doesn’t really mean much when the majority of your potential new patients will be searching for a dentist located in a nearby borough, not across town. Today, people have become smarter about how they search online. Instead of searching for a “NYC dentist”, patients are far more likely to search for more specific terms such as “dentist on 5th Avenue”, “Central Park dentist”, or “Bushwick dentist”. Additionally, the majority of Google searches are now conducted on mobile devices that use geotargeting when providing search results. This makes geographically based keywords terms such as “dentist near me” or “neighborhood dentist” far more important from an SEO perspective than ever before. So what does all this mean from an SEO standpoint? Simple – successful SEO strategies no longer hope to rank highly for prestige keyword terms like “dentist in New York City”. Instead, a successful strategy needs to narrow the focus to make local search results its top priority. By focusing on ranking highly for keywords terms that relate to, say, your borough, neighborhood, or street, you not only significantly reduce your competition for those keywords, you also start appearing much higher in the search results for the users that matter the most – patients nearby searching for a local dentist. Whether your practice is based in New York, Missoula, Portland, or Plano, making local search the primary focus of your SEO marketing strategy will draw significantly more new patients to your website than what you’ll catch casting a bigger net. With over a billion websites online, you might wonder how Google determines what sites it displays on page one versus, say, page 10 or 100 of a search result. While this question has a number of complex answers, one of the most important for SEO purposes is the quality of the content on each website. Google hates spam. As a result, Google pushes down any website in search rankings its algorithm determines offers poor quality content to potential visitors. One of the ways Google judges the quality of the content on a website is whether the content is original or the duplicate of another website. Just like copying and pasting a page from Wikipedia probably means receiving a failing grade on your history paper, copying and pasting text from WebMD about dental implants or fillings won’t help you pass Google’s requirements for original, compelling content. When Google’s bots examine your website, it quickly knows whether you have duplicate content and it will penalize where your website ranks in search results. When Local Fresh works with a dental practice on a new website design, we create original content for each individual client. Not only does original content improve Google’s review of a website, it also allows us to embed desirable keyword terms organically into the text, something cutting and pasting content from other websites just doesn’t allow. So you have a great looking website filled with original, compelling content that relates to your business on every page. You have successfully met Google’s content requirements and can now reap the benefits of improved search ranking results…for a while anyway. Google is fickle. Not only does Google’s search algorithm want websites to contain original content, it also wants that content to be relevant and up to date. Let’s face it, not a lot changes when it comes to dental implants, the importance of brushing and flossing, or the benefits of teeth whitening. Once a dental practice launches its website, not a lot of the core content changes, with the exception of the occasional update to the “About Us” page that occurs after a new team member joins your staff. When Google’s bots examine your website and notices that the available content found on the site rarely changes, your SEO ranking gets pinged. While the hit you take won’t cause you to plummet to the bottom of the page, it does put you at a disadvantage when compared to competing dental practices that regularly update their site with new, relevant content. By far, the best and easiest place to add new content to your practice’s website is to maintain a blog. Blogging enables you to write about the latest advanced in dentistry, announce community programs, or tout about your charitable efforts. Blogging also allows you to speak directly to current and prospective new patients about topics you are passionate about – for example, the need for improved dental care for kids – or to show off a sense of humor that might not come across during an exam or consultation. Starting to blog not only helps improve your SEO ranking, it can also provide a more personal feel to your dental practice that enables patients to better connect to you and what you stand for as their dentist. Late last year, Google announced a switch to mobile-first indexing of websites. Previously, when Google’s bots examined a website, they would do so from the perspective of a desktop user. As long as a website functioned properly for anyone interacting with the site on a laptop or larger-sized screen, it didn’t really matter if the same website functioned poorly when viewed on mobile devices. Google would still score the website highly in terms of functionality. By making the switch to mobile-first indexing, Google has loudly announced that websites need to function just as effectively on mobile devices as they do on desktops going forward. Failing to have a mobile compatible website means receiving a lower rating from Google regarding the quality of your website. The lower the rating, the more likely a site will drop in search results. This makes 2017 the year where businesses have to get onboard with mobile optimization if they hope to stay competitive. For more on Google’s switch to mobile-first indexing, read our post about what this policy change means to small business owners everywhere. With Local Fresh’s online marketing expertise for dental practices, you have a uniquely qualified partner that understands exactly what it takes to expand your patient base to help your practice grow. Our SEO experts will work to improve your local search results, improve core content, optimize your site for mobile, and write your blog. Whatever your needs, Local Fresh has your SEO solutions. 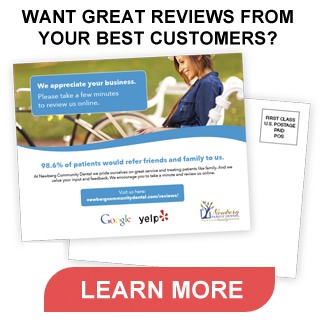 Click here to learn more about what Local Fresh can do for your dental practice.